What: The Native Hawaiian Hospitality Association (NaHHA) will be holding a community meeting to discuss the proposed Waikīkī – Kauhale O Ho‘okipa “Home of Hospitality” Scenic Byway as part of the Hawai‘i Scenic Byways Program. The public is invited and encouraged to attend this meeting. When: Wednesday, July 3, 2013 at 4:00 pm. Background: The Native Hawaiian Hospitality Association (NaHHA) is a 501(c)(3) nonprofit that works to perpetuate an authentic spirit of aloha and Hawaiian culture in the hospitality industry through corporate and community initiatives. For more information, visit nahha.com. The Hawai‘i Scenic Byways Program is part of the National Scenic Byways Program that showcases roads throughout Hawaii with an important story to tell to both visitors and local residents alike. For more information, visit hawaiiscenicbyways.org. 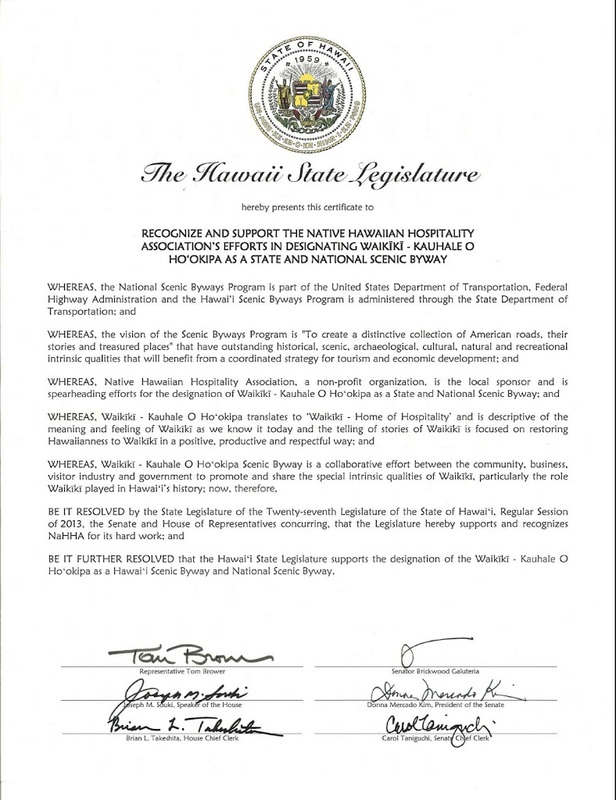 We are happy to announce that the Hawaiʻi State legislature just adopted a concurrent resolution (passed by the Senate and the House) in support of Native Hawaiian Hospitality Association’s (NaHHA,) hard work and efforts as the sponsor for the Waikīkī – Kauhale O Hoʻokipa Scenic Byway. The Legislature notes that “Waikīkī – Kauhale O Hoʻokipa Scenic Byway is a collaborative effort between the community, business, visitor industry and government to promote and share the special intrinsic qualities of Waikīkī, particularly the role Waikīkī played in Hawaiʻi’s history”. The Scenic Byways program serves to identify “Intrinsic Qualities” along the corridor; these include Scenic, Natural, Historic, Cultural, Archaeological and Recreational. We have been retained by NaHHA to help them with this process. You can see some of our other activities by clicking here. Feel free to “Like” us, if you like. You may also visit us at our home page by clicking here. We are happy to announce that Native Hawaiian Hospitality Association (NaHHA,) serving as the sponsor for the Waikīkī – Kauhale O Hoʻokipa Scenic Byway, has retained Hoʻokuleana LLC to assist in the application, designation and planning processes for the Byway through the Hawaiʻi Scenic Byway Program. 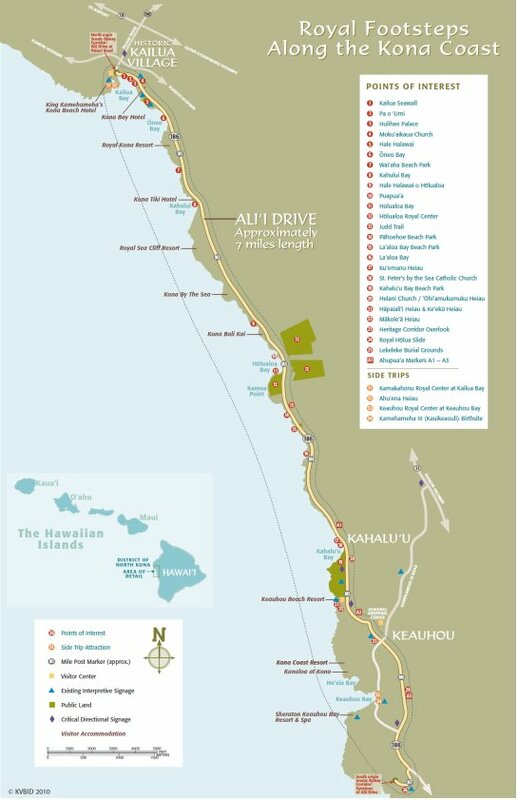 The Hawaiʻi Scenic Byways Program is designed to complement the National Scenic Byways Program, a nationwide effort to identify, promote, manage and invest in roadways that are the most significant in their region with regard to these scenic, historic, recreational, cultural, archeological and natural qualities. The purpose of the Hawai`i Scenic Byways Program is to formally designate Hawaiʻi Scenic Byways and to establish and implement Corridor Management Plans (CMPs) for our corridors. First, the name – it is not only descriptive of the meaning and feeling of Waikīkī as we know it today, it is also a metaphor of Waikīkī in traditional (ancient Hawaiian) times, at multiple levels. In ancient times, a ‘kauhale’ was a cluster of structures [a living compound.] The traditional Hawaiian home was the kauhale (Lit., plural house;) this was a group of structures forming the homestead – with each building serving a specific purpose. Literally, ‘Waikīkī – Kauhale O Hoʻokipa’ translates to ‘Waikīkī – Home of Hospitality.’ But, this context of “Home” can expand and also represent the community of Waikīkī. Starting with Māʻilikūkahi, who ruled in the 1400-1500s (at about the same time Christopher Columbus crossed the Atlantic,) Waikīkī became the Royal Center for Oʻahu’s ruling Aliʻi. It remained as such, through Kamehameha I. The Royal Centers were areas selected by the Ali‘i for their residences and Ali‘i often moved between several residences throughout the year. The Royal Centers were selected for their abundance of resources (water, fishing, fertile land, etc) and recreation opportunities, with good surfing and canoe-landing sites being favored. Although many of the sites and structures of Waikīkī from the ancient times are long gone, many of these pre-contact Hawaiian places, environment, people, history and culture still convey the sense of earlier importance through continued use of original place names for areas, streets, surf sites, symbols, etc and other references to these people, places and times. Though gone, they are not forgotten and continue to express the ways of the past. Through the telling of stories of Waikīkī (and a goal of the establishment of a Scenic Byway (and dream of NaHHA founder, George Kanahele,)) we help to restore Hawaiianness to Waikīkī in a positive, productive and respectful way. This is our third Scenic Byway opportunity. We also assisted the Kona Sponsor of “Royal Footsteps Along the Kona Coast” with their Corridor Management Plan (the first approved in the State,) as well as helping the Kōloa Sponsor of Holo Holo Kōloa Scenic Byway with their permits and CMP. In addition to each of those receiving Historic Preservation Commendations from Historic Hawaiʻi Foundation, the Kona project also received the Environment/Preservation Award from the American Planning Association-Hawaiʻi Chapter and the Pualu Award for Culture & History from the Kona-Kohala Chamber of Commerce. 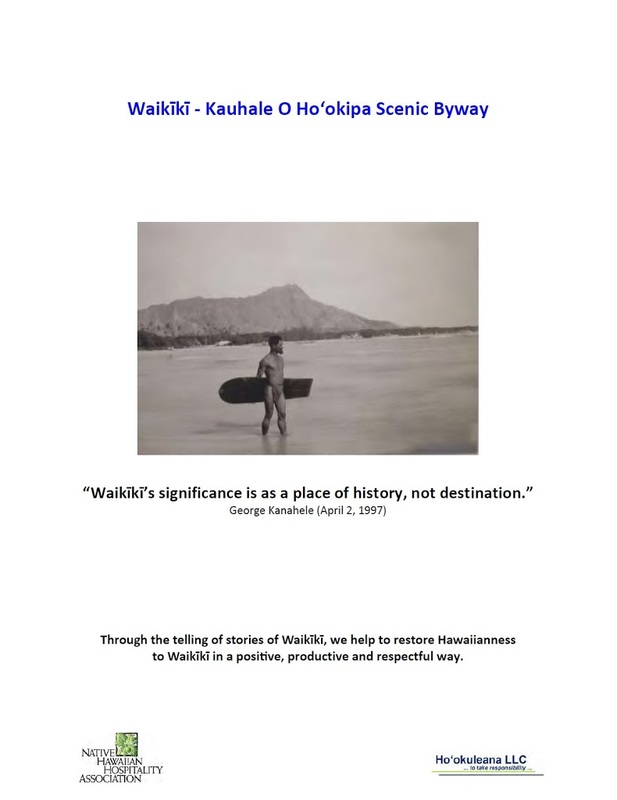 For more information on this project, you can click the following link for a background summary of Waikīkī, the Scenic Byway Program and the many stories that are told along its roadways. Royal Footsteps Along the Kona Coast Scenic Byway covers the entire length of Ali‘i Drive, seven miles of roadway and over seven centuries of Hawaiian Royalty archaeological, historic and cultural traditions that have shaped Hawai‘i into what it is today. By whatever means (vehicle, transit, bicycle or on foot,) following the footsteps of ancient royalty and embracing the scenic beauty, natural and archaeological features, historic sites, associated cultural traditions and recreational opportunities will give the traveler a greater appreciation and understanding of Hawai‘i’s past and sense of place in the world. We prepared the Corridor Management Plan (CMP) for the Royal Footsteps Along the Kona Coast Scenic Byway, the first CMP to be accepted by the State of Hawai‘i Department of Transportation. We are proud and honored that American Planning Association-Hawai‘i Chapter selected Royal Footsteps Along the Kona Coast for the “Environment/Preservation Award”, Historic Hawaiʻi Foundation awarded the 2011 Historic Preservation Commendation and Kona-Kohala Chamber of Commerce awarded the 2011 Pualu Award for Culture & Heritage. The image shows the Royal Footsteps map; in addition, images of each of the sites are added to a folder of like name in the Photos section of my Facebook page.